All butter croissant pastry filled with raisins and crème pâtissiere. 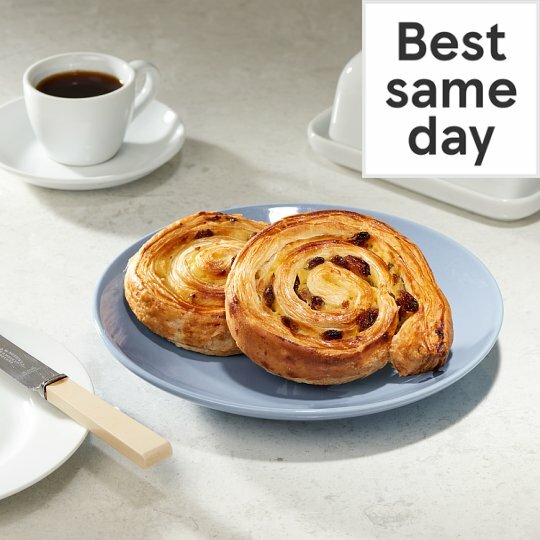 All butter flaky pastry swirled with juicy raisins and crème patissière for a sweet treat. INGREDIENTS: Wheat Flour, Unsalted Butter (Milk) (16%), Water, Raisins (13%), Sugar, Yeast, Thickener (Modified Potato Starch), Pasteurised Egg, Dried Whole Milk, Wheat Gluten, Salt, Whey Powder (Milk), Dried Egg, Flavouring, Colour (Beta-Carotene), Yeast Powder, Vanilla Seeds, Vanilla Extract, Flour Treatment Agent (Ascorbic Acid). Contains milk, wheat and egg. Our bakers prepare a variety of products in our bakeries, this product may also contain peanuts, nuts, sesame, egg, soya and other allergens For allergens, including cereals containing gluten, see ingredients in bold.